Mo vie Review by Fr. Tom Condon, O.P. Now that it’s Lent, with Easter a few weeks away, there are some religious movies making their way to mark this holy season. The first is an interesting movie called Risen. Risen tells the story of the Roman Tribune Clavius who patrols the Judea around 33 A.D. Clavius is somewhat world-weary. He’s tired of battle and Jewish rebels and is eager to return to his family. Clavius is ordered by Pilate to watch over the crucifixion of Jesus. He is the one who orders a lance thrust into Jesus’ side, and secures the tomb with a large stone and soldiers to guard it so the body will not be stolen. When Easter Sunday occurs and the tomb is found empty, Pilate orders Clavius to find the body as soon as he can in order to stop rumors of resurrection. While searching for the body, Clavius finds more than he bargained for, which sends him into a crisis of faith. Could the resurrection actually be a reality? Could these ridiculous rumors actually be true? 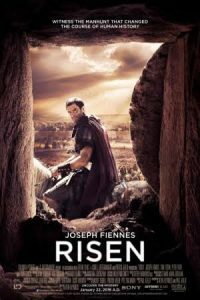 Unlike most Biblical films, Risen begins with the crucifixion, and covers the days or weeks immediately following. So it’s certainly not your usual story of the Gospel. I do have problems with the way Jesus appears after the resurrection. He looks exactly the same as he did on the cross, only cleaned up from the terrible crucifixion. This goes against the Gospel accounts that Jesus was somehow different in appearance after the resurrection, which is why Mary Magdalene and the disciples did not recognize him at first. Clavius recognizes him immediately. Risen benefits greatly from the performance of Joseph Fiennes as Clavius. From his early weariness to determination to disbelief at what he sees, Fiennes does a great job. Clavius is not a monster, just a man doing his job, who is searching for truth and meaning in life, finding it in unexpected places. The character of Clavius represents all of us in our faith journeys. Risen also falls into annoying habits of Biblical films, having many members of the cast speak in English accents. In addition, Mary Magdalene is identified as a former prostitute. Isn’t anyone familiar with contemporary Biblical study? Even with its flaws, Risen is worth seeing as Holy Week and Easter approach. Clavius helps us to ask what we need in order to believe that Jesus Christ is truly risen from the dead.